Disclaimer: This article contains images and affiliate links from Target.com and Amazon.com. You will not be charged extra from using these links to make purchases, and I will get a commission to help support my site! Hey there Mommy Bears, With it being April and everyone thinking about Earth Day, I decided to write about a recent change we made towards going “green”. The situation was that I don’t like the water that comes out of our tap. Our solution was to buy 24 packs of water bottles almost every time we went shopping. After doing this for awhile, not only did I notice that most of our trash was made up of water bottles, but we would also have the odd one here or there that was left around the house, snuck into the couch cushions, or fell off the nightstand and rolled under the bed. This seemed wasteful and messy. My husband and I started looking for a good solution where we could have filtered water, not spend a ton of money, AND not make such a mess around the house, not to mention all the plastic we wouldn’t be using and throwing away. Here was our solution. Here are some facts taken directly from Ban The Bottle. 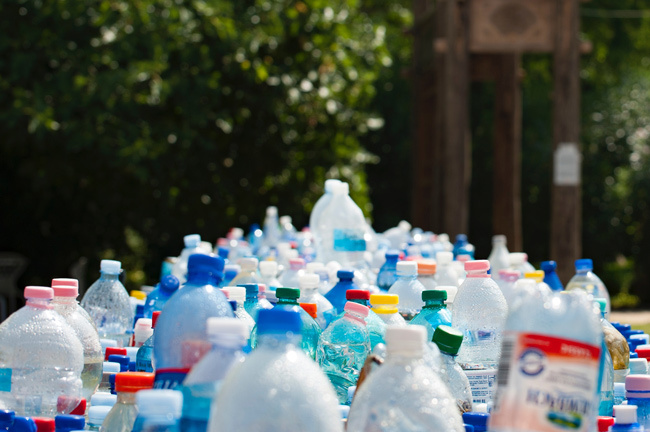 Americans used about 50 billion plastic water bottles last year. If you want to read some more, I suggest checking out the site link for Ban The Bottle above. It is insane that we use this much oil to create that much plastic for 50 billion plastic water bottles a year. As a mother this is all very concerning for my children’s future. Ban the Bottle states that only 23% of these bottles are recycled, which means a lot of plastic left on earth that my children and future generations have to deal with. It just doesn’t make sense that we are doing this. Being a mother I am very concerned with my children’s future, and given the fact that we are just now getting out of winter in April, things are definitely changing with our environment. In doing our part (and also to save money; see math section below) we decided to look into water filter systems. 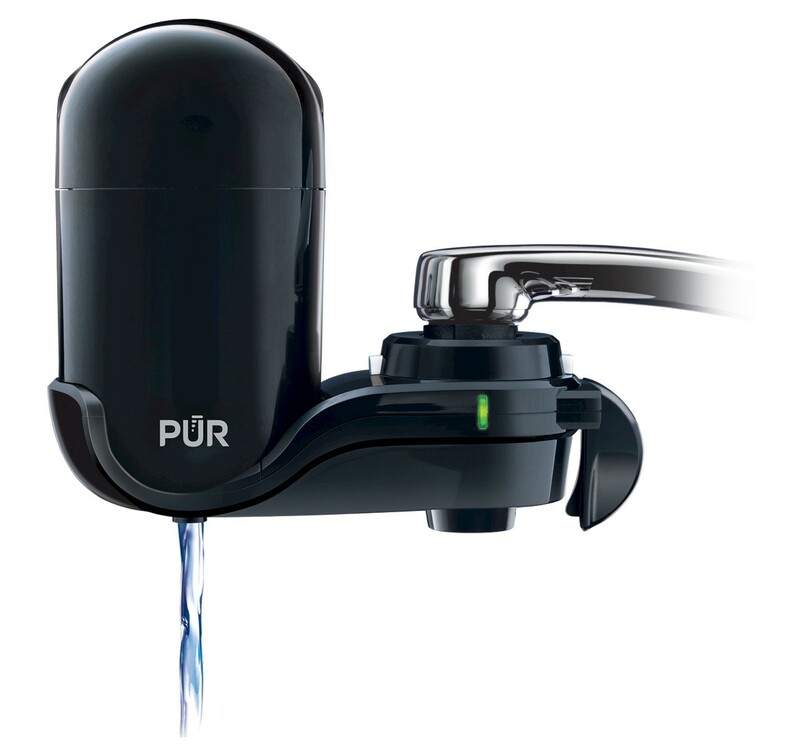 We thought that it would be best to go cheap and easy, and purchased a Pur 18 Cup Water Pitcher. This comes with 1 filter and gives you 40 gallons of water (which they say is approximately 2 months worth). The pitcher sits in the fridge and has a convenient tap to release the water. Fill it up every day or so, and we are good to go! The filters are fairly cheap, and also are recyclable when we are done with them. It’s really a win all around. Now we’ve talked about the harm of water bottles and my solution, I hope you are convinced. If not, let’s run through some math to prove that this will not only save the Earth, but it will save you a bunch of money as well. 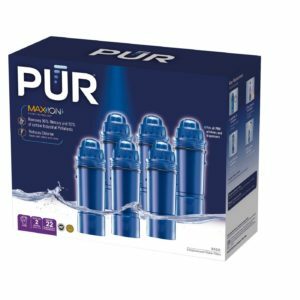 We chose the PurAqua Purified water bottles every time we shopped at Aldi. Nothing against Aldi in particular, because a bottle is a bottle, but this was the cheapest deal on water we were able to find. It cost $2.29 per 24 pack of bottles. We would buy about 3 of these a week, mostly just for my husband and I. That’s $6.87 per month. With 24 bottles per case at 16.9 fl oz of water per bottle, we would be getting 9.51 gallons of water per month, making it $.72 per gallon we bought. It may not seem like much, but this is $14.40 per 20 gallons of water. We will get to why this is an important number for comparison. 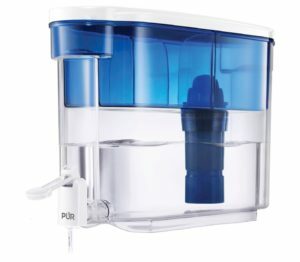 As a replacement to water bottles we bought a PUR 18 Cup Water Filtration Dispenser that came with 1 Filter. At the time this pitcher cost us $26.87. 1 filter is supposed to last for 2 months, or 40 gallons of filtered water. That’s 20 gallons of filtered water per month. Divide the cost of the pitcher by 2, and you get $13.44 for 20 gallons, or $.67 per gallon. We are already ahead in the first 2 months. The pitcher has paid for itself easily. We have saved around 144 plastic water bottles in this first 2 months. And then, it only gets cheaper. We are glad we made the switch. I personally like drinking out of a bottle rather than a glass (toddles love to tip glasses), so I purchased a good, reusable water bottle for around $12. This is a one time cost and still fits my need to prevent toddler messes. I know we are only one family, and there is a long way to go to fix this problem, but if you are still reading this, I implore you to give it a try. If you don’t like constantly refilling the pitcher, there are equally cheap options for filters that hook right onto your tap. Easier to use, so no excuses there. With the amount of money you can save as well, I don’t see any reason not to make the switch! What are your thoughts on plastic water bottles? What is your solution to banning the bottle from your house? I’d love to discuss with you down in the comments!